I grew up in Vermont on a small farm with parents who embraced the back-to-the-land movement. I had 60 chickens, raised sheep and tapped sugar maples. It was a time when hippies were moving to the state with great expectations and a plethora of creative ideas. In the 1970’s Vermont was alive experimenting with alternative building methods and home energy ideas. My dad was an architect and I was awed as a kid by his beautiful pen and ink renderings and amazing balsa wood models. We spent many hours fixing up our old farm house and working on the various outbuildings around the farm. I loved the hands-on satisfaction of creating and building things. When my dad saw my interest in hand drawing, architecture and building construction, he let me tag along on his jobsite visits and later connected me to many summer construction jobs. This was an invaluable experience showing me how things go together…. or not. I got to see several experimental and creative passive and active solar projects. I went to architecture school at Kansas State University. (A practical move as it limited my passion for the mountains and for skiing). You would think a school in the middle of Kansas would be very conservative, and although some things were, it was a very creative and inspiring time for me. I discovered Christopher Alexander’s, A Pattern Language, and I’d thought I found the real bible. My thesis in school was, How to Make a Small House Feel Large. I established ten guidelines or patterns that worked to increase the perceived dimensions of spaces. 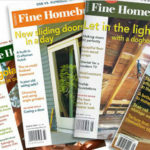 An article I wrote for Fine Homebuilding titled, Big Ideas for Small Houses, published a few years ago summarizes this work. I did my school internship in the office of Bohlin Cywinski Jackson, with Peter Bohlin in the Wilkes-Barre Pennsylvania office. This was another very influential and creative time for me. They instilled the mantra “See the problem as an opportunity” and we did. When Peter announced they’d just won a competition with Jim Cutler to design Bill Gate’s house. He asked if I would be willing to work on the project. Obviously I jumped on it. I worked on the Gates project for almost 6 years. After the Gates project and a short stint in Jim Cutler’s office, I worked for Marc LaRoche architects. 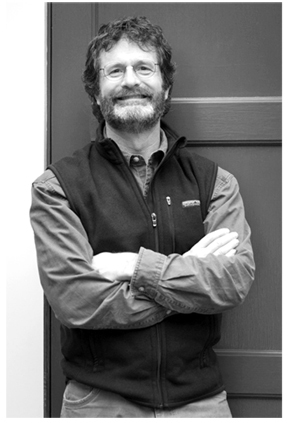 They had a connection in the San Francisco Bay area to one of the founding partners of Oracle Computers. I worked on several projects from wineries in Napa Valley to a 12,000 square foot compound in San Francisco. Again great experience, but I had a nagging feeling that it didn’t feel right working on these big projects. Many of these projects claimed to be using environmental care in construction. And yes, there was a lot of good that came out of it, but they were also laden with environmental irony. For instance, the product might have been sustainably harvested, but it was shipped from half way around the world and we need 5 tons of it. A great house doesn’t mean it has to be big. It’s not ego building, it’s eco building. I love the quote by William Keeler who wrote a hundred years ago “better a house be too small a few times a year than too big the rest of the year” ! I’ve heard that Bill and Melinda’s favorite place to hang out is in their 500 square foot lakeside pavilion. And it is no wonder. The cozy space is well proportioned, wrapped in warm wood, flooded with natural light, and anchored with stone and heavy timbers. My architectural life has been inspired and influenced by the big, the small and the in-between. But finally, I’ve came back to my roots and thus my strong belief that we can all create and build amazing buildings with respect for the land and our valuable resources. The importance of building sustainably has never been more important than it is today. With numerous environmental design awards and certifications, Studio Hamlet Architects is committed to integrating green building principals on every project. We are passionate about making your project energy efficient, healthy and environmentally beautiful. This award winning and widely published house was designed and built to present and demonstrate a better model for the future of housing. It has received significant praise from many of our nation’s leading green building and energy conservation professionals. 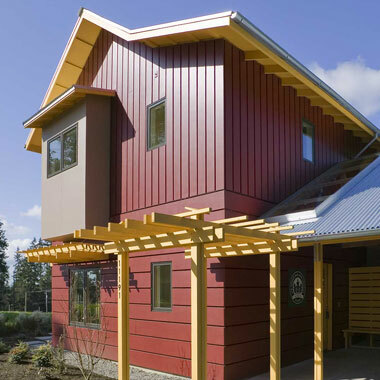 The house was designed to take advantage of its site, utilizing passive solar heating and passive cooling techniques. 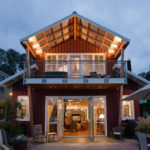 Constructed with advanced framing methods, tight construction detailing and bio-based foam insulation, this house uses minimal energy for heating. 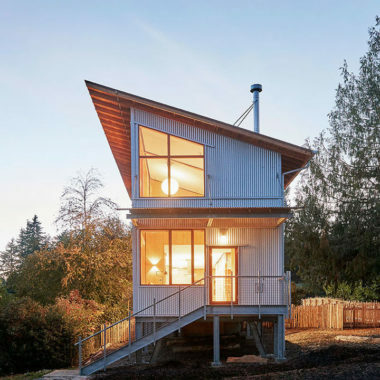 A heat recovery ventilator, least-toxic materials and large operable daylight windows make this a very healthy and comfortable home to live in. The design character of these houses was driven by a desire to fit into the established historical character of the neighborhood. We studied the older island homes details and proportions to capture a timeless feeling. 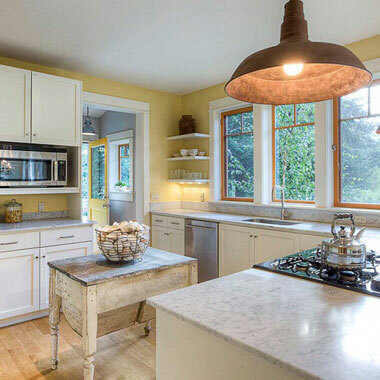 But these houses are not your typical Bainbridge Island homes. The Rolling Bay Cottages are a pair of innovative energy efficient homes, built to some of the highest environmental standards. As demonstration homes, they meet 5-Star BuiltGreen, as well as the U.S. Department of Energy’s Builders Challenge. This jewel box accomplished big things on a tiny restricted site. Only allowed to be 16 feet wide, this house lives large with soaring glass and amazing views of Mount Rainier. Building and remodeling on waterfront property is complicated. There are numerous new regulations and environmental complexities to manage. We have the experience and the relationships with key consultants and regulatory officials to shepherd your project through the process from start to finish. 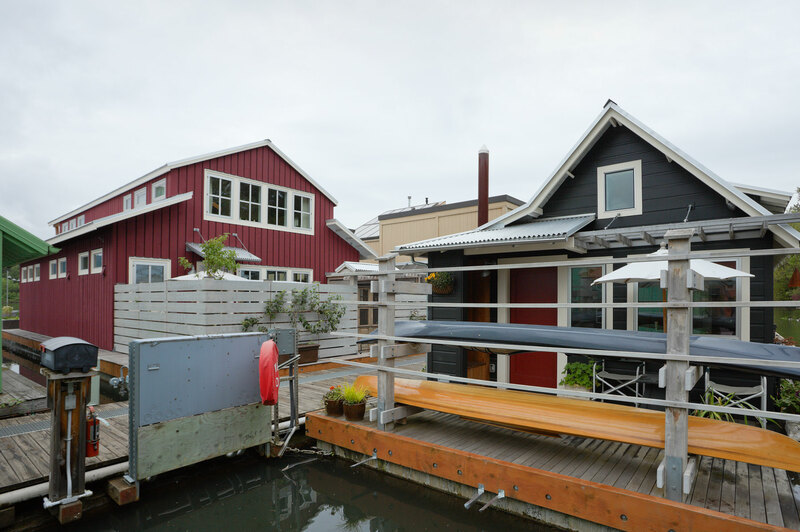 If you are considering a building project on the waterfront, give us a call first. 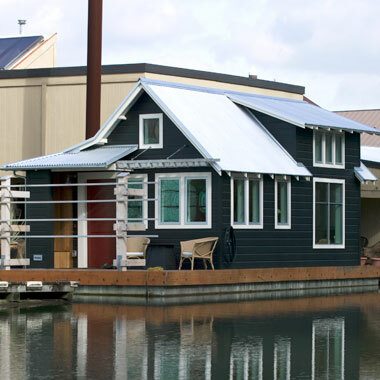 There are many advantages to building smaller and more comfortable homes. But achieving successful smaller spaces requires careful experienced design. We are recognized nationally for our authoritative research and design of small beautiful spaces. If you want to get the most out of your project, call on our expertise. 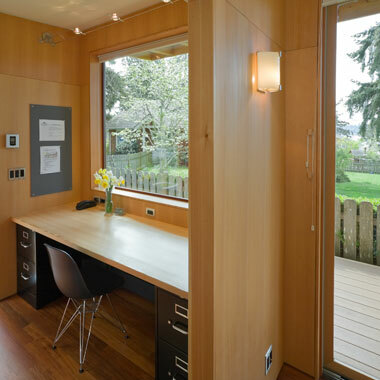 With a sod covered roof this remarkable 200 square foot (smaller than a one car garage) structure has an office, a conference area, a guest studio with a queen bed, a half bath and is a showcase of green building practices. Many design techniques were used to fit all the functional needs into the space without having it feel small. “This studio is a marvel of how small small can be- and still be nice”. In addition to the small area big impact design, this project includes a host of alternative building materials that conserve resources. Large south facing windows let in so much natural light that electric lighting is rarely needed during daylight hours even on gray days. 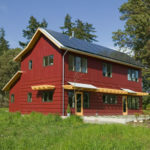 The passive solar gain, combined with the sod insulation on the roof and recycled denim insulation in the walls, makes for miserly energy consumption. 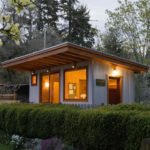 A composting toilet, rainwater collection system, salvaged wood flooring, FSC certified locally sourced Douglas Fir paneling and recycled bricks complete the array of secondhand and sustainable materials. This project has been widely published and has received several awards for its design and utilization of techniques to make small spaces feel larger and more spacious. 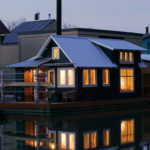 The judges pronounced this floating cottage “compact and beautifully crafted, built like a boat on the inside and like a fisherman’s cottage outside.” Clever design and well-chosen materials make this small home feel much larger than its actual square footage. It’s open, yet subdivided: A sunlit sleeping loft provides a getaway, and its ship’s ladder subtly screens the living and dining areas while allowing the eye to look through it. Its foundation is a floating concrete platform that was an innovative and more permanent alternative to typical traditional log float structures. Wood for the floors was salvaged from sunken longs in the Columbia River. The corrugated metal ceiling echoes the water ripples and dances with movement as it catches the reflected natural light from outside.